Proc.No.1252, Dated:11.10.2017 :: Sub: RMSA, TS, Hyderabad - Conduct of Science Exhibition & Book Fair, District level Sports tournaments, Workshops and Vedic Maths - Release of Budget - Orders - Issued - Reg. Read: RMSA Annual Work Plan and Budget 2017-l8. 1. An amount of Rs. 1,00000/- each was allotted towards conduct of District Level Science Exhibition & Book Fair. 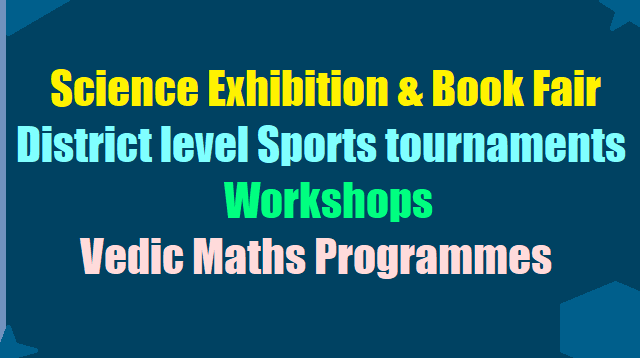 Therefore, all District Educational Officers in the State are requested to conduct to above mentioned programmes at the earliest as per the guidelines Issued by the Director, SCERT, Telangana, Hyderabad or guidelines of the NCERT, New Delhi in conducting Science Exhibition should be followed and further with regard to conducting District Level Sports Tournament "khelo India" guidelines issued by Ministry of Youth & Sports, Government of India should be observed. However. soft copy of the guidelines is communicated to DEOs through E-mail. Further, all the DEOs should submit the original bills / vouchers for the amounts expenditure and remit the unspent balance amount if any through DD to this office and also submit compliance report along with photographs to this office without fail. The Accounts Officer, RMSA of this office is requested to transfer above sanctioned amount of Rs.49,18,000/- (Rupees Pony Nine Lakhs Eighteen Thousands only) to the Bank Accounts of the District Educational Officers as shown above through ECS immediately and meet the expenditure tinder the concerned sub component of RMSARecurring Grants. This has got approval of the Commissioner & Director of School Education & Ex-Officio Project Director, RMSA & Model Schools. Telangana, Hyderabad.